On the afternoon of Saturday 16 March 2019, the first proper rain for ages fell in Dungog. 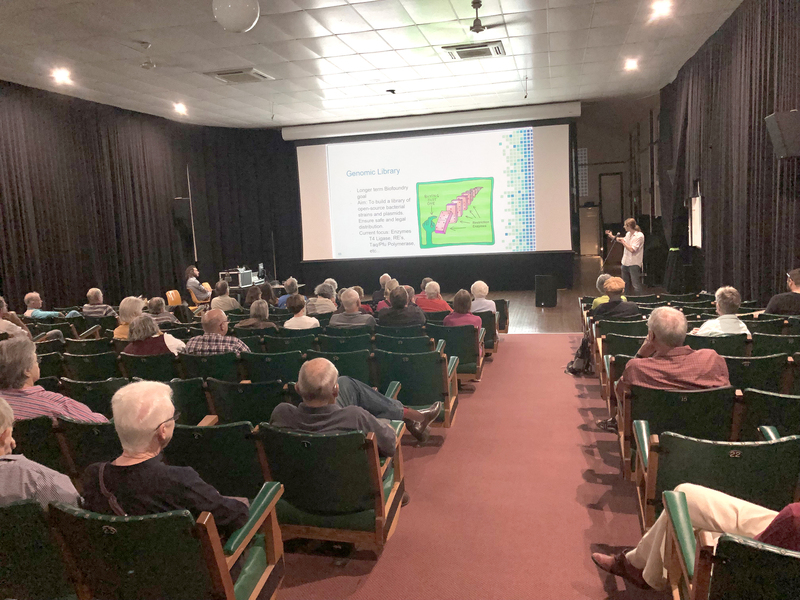 In addition to the rain, those who came to the James Theatre were also able to enjoy a fascinating pair of talks on the structure and function of DNA, presented by the Paterson Allyn Williams Science Hub. The two speakers were Laura Greco who is studying a PhD in medical genetics at Newcastle University and Alex Kelly from BioFoundry who works in the DIY field of science. Together they gave a complete picture of DNA. Laura explained how our understanding of genetics got to be where it is today. Then Alex explained the rapidly advancing area of genetic manipulation. What was interesting was that the speakers didn’t just fit together chronologically. They were able to show how different their respective research environments are. Laura has access to academic resources and is subject to tightly controlled constraints and regulations, whereas Alex, coming from the biohacking community, has problems funding his research. However, he has fewer controls on his work. Laura made the basic principles of genetics understandable by using interesting analogies. She left us marvelling at how amazingly small are the detailed structures that control all life forms. She also elaborated on some well known examples of genetic manipulation and compared slow genetic manipulation by controlled breeding with the rapid changes made possible by genetic engineering. Alex revealed the existence of an international group of scientists, collaborating together outside of academia and operating on limited funds but with strong collaboration. He explained how control by the three insulin producing companies has led to the prohibitively high cost of insulin even though production costs are very low. The amazing rate of change in genetic engineering techniques was emphasised by his description of a kit that people can use to carry out safe and simple genetic modification of a bacterium in their homes. After their talks, enthusiastic questions from the audience took up more than the available time and Laura and Alex collaborated to give thoughtful and thought provoking answers. These two young scientists are impressive in their commitment to science, the clarity of their presentations and their awareness of future benefits and pitfalls in their subject area. It was a very stimulating and enjoyable rainy evening made possible with the support of Inspiring Australia. Guest post by Ruth Dircks and images courtesy of the Paterson Allyn Williams Science Hub, Learn more about the region’s upcoming community events and how to get involved on the group’s Facebook Page.